TOBROCO-GIANT has been manufacturing quality GIANT machines and attachments since 1996 when we opened our first factory in the Netherlands. 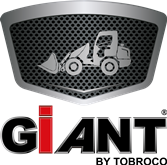 Today, TOBROCO-GIANT offers one of the broadest product portfolios in the business with a total of 36 different models in 40 countries, designed and build by a team of 240 enthusiastic employees in our modern factory in Oisterwijk, the Netherlands. Thanks to state-of-the-art technology, continuous development and the best components of Kubota, Bosch Rexroth and Comer, TOBROCO-GIANT produces machines and attachments with the utmost care, quality and commitment for the worldwide machinery market.